Another 46 wins & 62 nominations. | With grit, style and substance, Creed goes the distance as an exceptional crowd pleaser. History has a strange way of repeating itself. 40 years ago, Rocky Balboa became a household name and turned an unwanted actor into one of the greatest success stories in Hollywood. The fact that Rocky (1976) won three Academy Awards including Best Picture is of little importance compared to the real life struggle behind the making of that film. For Sylvester Stallone, it was a rags to riches story that mirrored his real life struggles to make a decent and honest living. Cut from the same cloth maybe, but Creed is much more than just the seventh installment in the Rocky film franchise. As a no- holds-barred sports drama, this is every bit an exceptional crowd pleaser with a lot of heart, plenty of amusing jabs to the ribs, and an unexpected but emotional haymaker to the gut. And a lot more. Co-written by director Ryan Coogler, there's no doubt that Creed is a passionate love letter to the first film, which in itself is a poetic love story about fighting the good fight. Although boxing is the central theme, and often frowned upon as a brutal blood-sport that causes serious injuries, it's never been about the fight but more about what you are fighting for. Coogler gets this spot-on when we are introduced to teenager Adonis Johnson in juvenile detention. We soon learn that Adonis is the illegitimate son of Apollo Creed, born shortly after the latter's death in Rocky IV. Appolo's widow Mary Ann (Phylicia Rashad) rescues young Adonis from what is certain to be a life on the streets and raises him as her own in the plush Creed estate in Los Angeles. Cut to present day and Adonis (Michael B. Jordan) is a corporate executive half way up the ladder. It's a stark contrast to Stallone's blue collar stiff in the first film, but this is where both films converge. Like Rocky, Adonis (calling himself Donnie) knows he is destined for something else, so heads to Philadelphia to meet his late father's rival turned best friend. The meeting with Rocky is one of several great moments in the film while also serving as a nostalgic homecoming occasion for every fan of the franchise. It's a fascinating intersection of the past but none better than the fact that in many ways, Creed is an inverted mirror image of Rocky. And before sending this film off on its own pulsating trajectory, Coogler reveals a full hand of spades. One of which is the legacy Rocky bestows on Donnie, and in essence, Stallone handing over the franchise baton to Jordan. We may not realize this at first and that's because we are already smitten by the father-son relationship developing between Donnie and Rocky. Their character study is the most significant aspect of this film. Donnie has always been an orphan and the reason why he never took on his father's name is an emotional revelation. Who he is and why he wants to become a professional boxer is his darkest secret. Both equally emotive and with comic interruptions, Jordan and Stallone deliver impressive performances. 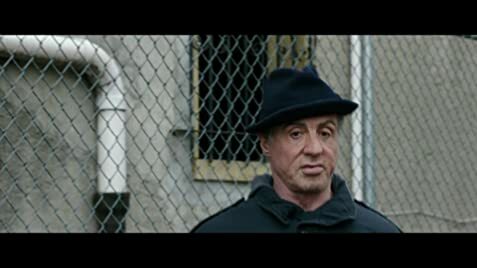 Stallone in particular gives what has to be his career best performance since Copland, and if this is his franchise swan song (owing to a devastating but befitting plot device) that's all the more reason why this film must be seen. But as they say, the show must go on and Jordan is more than capable of shouldering future films under the Creed banner. And with the inclusion of Philly local Bianca (Tessa Thompson), Donnie's neighbor and love interest, future sequels look to be set in Rocky's beloved hometown. Onto the production quality and it suffices to say that Creed has THE best technical aspects in the franchise, including spectacular fight choreography, astounding cinematography in the ring and around Philadelphia, and an upbeat hip-hop soundtrack fused with the original score from previous films. The only real letdown comes from Donnie's main opponent (Real life professional boxer Tony Bellew) who isn't as antagonistic as you would expect, given the villainous ferocity from Clubber Lang (Rocky III) and the evil Ivan Drago (Rocky IV). But that's a minor blemish to an overall outstanding film made with grit, substance and style. At its best, Creed is a very intimate film for fans and newcomers and an undisputed knockout for 2015. Michael B. Jordan was born in 1987, 2 years after the fictional death of Apollo Creed. Rocky Balboa: That's the toughest opponent you're ever going to have to face. When Adonis tries on his father's shorts, there is a stain on the mirror. Later on, the stain mysteriously disappears without anyone cleaning it. Only movie in the Rocky series which Stallone didn't get top-billing. SPOILER: In the final theatrical release of the film, Adonis Creed loses the fight to Pretty Ricky Conlan by split decision, mirroring the end of the original Rocky. However, another ending was filmed in which Creed wins the fight.